If there is irony in “First Man” it pertains less to a story concerning the first mission to the moon deliberately reduced to the scope of a character study, particularly because the space flight sequences are still so thrillingly rendered, than it does to that character study focusing on a character, Neil Armstrong (Ryan Gosling), who, aside from his lunar feat, was perhaps most famous for his privacy, shunning the public eye for a quiet life of lecturing and teaching. That’s not to suggest he was some enigmatic hermit, as James R. Hansen’s book, “First Man: The Life of Neil A. Armstrong”, and upon which “First Man” was based, makes clear. And while Armstrong is not portrayed as such, he is still transformed into something more like a tormented soul suggestive of a modern indie loner given director Damien Chazelle’s jittery handheld aesthetic and Gosling’s repressed performance that never lets us all the way in no matter how close the camera gets. “First Man” puts you on Armstrong’s level immediately by way of his 1962 X-15 test flight as Chazelle jarringly forgoes any establishing shots to simply drop us inside the jet’s almost indecipherable cacophony. Though there is dialogue between Armstrong and Mission Control, the latter of which we never see, it is virtually inaudible over the terrible racket, the sound itself communicating the flight’s distress until all that clamor cuts out completely when Armstrong’s flight breaks through the atmosphere and into the edge of space. It is sudden, if brief, peace above the earth, before he plummets. It sets the template of Armstrong’s cool under pressure, yes, but also how Chazelle films the action – that is, intimately, viscerally, gut-churningly, and often obliquely. There are scenes of Armstrong and his Gemini recruits throwing up after getting turned every which way but loose on some sort of flight simulator and “First Man” brings you to the brink of feeling sick too, ensuring you understand that the Gemini Project and Apollo Missions were not experiences to enjoy so much as ordeals to survive. Astronauts are strapped into their tin can capsules upside down, emphasizing the cramped, claustrophobic nature of early space travel, and the windows barely seem conducive to seeing through, brought home in Apollo 11’s arrival at the moon where their destination dropping into view is not an awe-inspiring reveal but virtually out of focus, an immaculate evocation of how abstruse the awesome must have been to space flight’s pioneers. If the latter fuzzes up the seeming inherent transcendence in walking on the moon, so does a mid-movie montage featuring Gil Scott-Herron (Leon Bridges), whom Chazelle cuts to throughout, reciting his poem “Whitey’s on the Moon”, a lyrical critique of the space race as a Patriotic dog and pony show ignoring so many earthly problems by wasting money. This is the most pointed rebuke to the mission, proving the movie is less interested in Who did what, as all that nonsensical pre-release consternation drummed up sight-unseen suggested, than a more philosophical Why it was done at all. Yet it is a question the movie cannot answer specifically because the characters, or, more accurately, character, is not interested in answering it. If the space race is mentioned a couple times tangentially, “First Man’s” Armstrong has nothing to say on the matter. 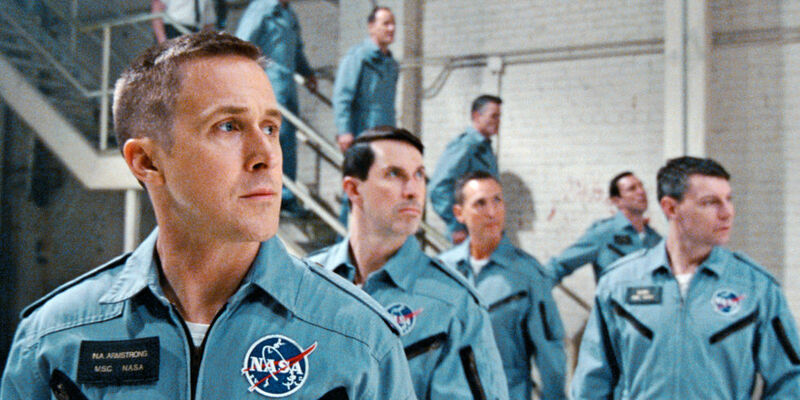 At a Washington D.C. schmooze session, when Armstrong learns by phone that the three Apollo I astronauts have died, Gosling refuses to betray if his character’s terse anger is from the senselessness of lives lost or how these lives lost might repudiate the Apollo missions altogether. Later, a sequence in which Armstrong’s wife Janet (Claire Foy) literally forces her husband to sit down and talk to his sons before embarking for the moon, perhaps never to return, Gosling does not settle on being purposely closed off or just too erudite for his own good (“Do you have any other questions?”). There are moments when Armstrong’s lurking humanity is hinted at, like a dinner with several other astronaut families, where he haltingly acknowledges a musical he wrote in college. It gives you a sense of why Janet might have fallen for him in the first place, though even there, in Gosling’s comically dry explanation of “the Land of Egelloc”, he expresses a sheepishness that is politely standoffish. If it’s true to the person, it makes things tough for the character Chazelle is trying to create, which winds up tying all Armstrong’s motivation to the death of his two year old daughter Karen from a brain tumor. That terrible moment is re-visited throughout, whether in cryptic conversations, flashbacks, or hallucinations, explicitly tying the character’s reticence to this tragedy since Gosling gives nothing else away. As such, the moon’s desolation, which Chazelle makes very clear with shots of the empty, gray vistas, becomes a metaphor for Armstrong’s own, until he casts it off through a totem of his daughter’s, ostensibly healing his wound, though the closing shot of a glass partition suggests there is still ground to cover. And though early in the movie Armstrong explains the meaning of going to the moon might only become clear upon reaching it, “First Man” is so intent on connecting that meaning to what precedes the moon landing, the concluding triumph is reduced to hoary catharsis. Lovely, thoughtful review, as always, my friend. Reading this just makes me wish the movie performed better overall. I'm surprised not as many people showed up for it as I thought they would. Thanks, Alex! Chazelle intrigues and frustrates me. He's clearly got tons of talent but I don't know...I haven't been able to get all the way there with one of his films yet.